Sometimes just reading the newspaper can change the course of your life. That’s exactly happened to this Physics Groupie a few years ago and I’m quite grateful for the experience. The Saturday, June 10, 2006 edition of the Los Angeles Times ran a front page “Column One” article that served to significantly refine my scientific focus which at that time was a bit overly broad. The significance of the article is ironic given the budget cuts many newspapers have experienced of late, not to mention that science coverage is almost non-existent in most newspapers. Yet, there it was, “Gravity’s Field of Dreams” by John Johnson Jr., an excellent piece describing the search for gravitational waves and the project called LIGO (laser interferometer gravitational wave observatory) designed to detect the waves. This article served to direct me to the scientific field that I ultimately chose to devote my time to – gravitational wave astrophysics. The point is that the event or circumstance that pushes you to a specific field of research may come from an entirely unexpected source. Just keeps your eyes open for opportunities like this. In early February 2007, Zoe and I decided to visit the LIGO Hanford observatory. I contacted the observatory’s education and outreach coordinator Dale Ingram to schedule a private tour of the facility. I found that LIGO is very open and enthusiastic to receive visitors. We flew into SEATAC (Seattle/Tacoma International Airport), and then took a short flight to the small town of Pasco. There is a tri-city area consisting of Richland, Pasco, and Kennewick. We decided to stay at a new, centrally-located motor lodge in Pasco. We took some time to explore the area and take in some local color at a microbrew and some good restaurants Zoe found for us. The next morning we were able to take a modest drive to the Hanford facility for our tour. Upon arriving at the LIGO facility, I was greatly impressed by the uniqueness of the area. 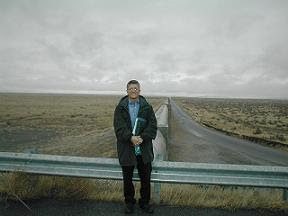 Hanford is located in an area of windswept desert very much unlike most of Washington State. It was cold, bleak and the featureless horizon stretched on for miles and miles. Due to very little precipitation, the entire area is devoid of vegetation. In a way, the stark environment would be quite compatible with ground-breaking scientific research. In a place like that it would be hard to get distracted from your work. During our visit, Dale provided a wonderful all-encompassing tour of the entire facility that included a visit to the control room where scientists can monitor an impressive array of projection screens showing a wide variety of indicators, and system status displays (see the photo of me standing in the control room that is attached to my profile for this blog). The visitor’s center includes a large lecture hall where public presentations are made, and some fascinating displays about the science of detecting gravitational waves. The lobby even has a real life “Weber bar,” a device once thought to have made consistent detections (currently no direct detection has ever been made) of gravitational waves. Dale graciously lined up a meeting for me with one of the resident scientists, Dr. Michael Landry. “Mike” as he likes to be called, was very receptive to my ideas of applying my background in data mining, specifically evolutionary algorithms, to the analysis of LIGO data. Mike was a stoic, contemplative experimentalist who headed up the Continuous Wave (CW) group for LIGO. His group monitors one potential source of gravitational waves, pulsars. I didn’t know much about pulsars at the time, but I made it a point to get up to speed with them. I noticed a book on Mike’s desk when I sat in his office. I asked him weeks later for the reference, “Pulsar Astronomy,” and now the book is one of my favorites. As I sat in Mike’s office, I couldn’t help but notice the austere view from his desk overlooking the Washington desert. This place would be perfect for conducting serious research. Zoe’s and my short trip to this science facility proved to be very rewarding. I came away from the visit with vigor in my desire to learn more about the field and investigate ways I could participate in on-going research. This was probably one my most productive science trips ever!